So it seems social media has gone a little crazy today with the hashtag #Bressure, which I believe was instigated by Channel Mum. (By the way if you don't follow them then where have you been? 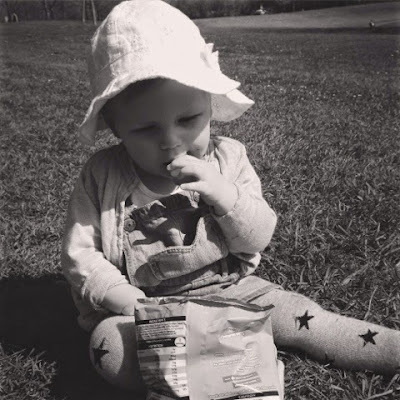 It is full of mums just like us talking about all kinds of issues and they blog and vlog!) I believe that the idea was to show support for mums however they feed their babies, if that be my bottle or breast. I don't think it was designed to be pro - breast feeding, although that seems to be how the media have spun it, as usual. And as usual the media have caused a big controversy around it, how many times will this argument go around? Women have been feeding their babies forever, and that is all it is, as simple as a mother feeding her child milk whether that be in a bottle or from her breast. SIMPLE. This pressure shouldn't exist and this controversy definitely shouldn't either. 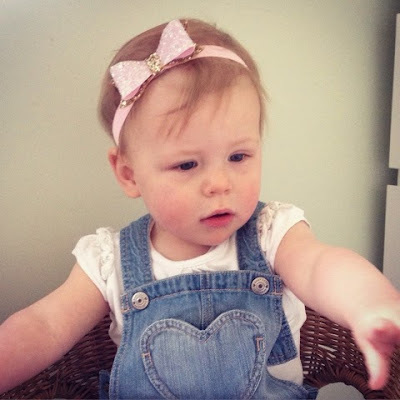 I was lucky in that I was able to breastfeed Daisy relatively comfortably and easily from day one, yes I had that initial first few weeks where it felt the world was against me, she wasn't getting enough milk, her weight was dropping far more than the professionals wanted her to and it bloody well killed!!! I thought labour was bad enough!!! Not what you want when you have just had other regions of your body torn into pieces as well! But it was all worth it for me and I enjoyed it once that first month was over with. It was time for me and my Daisy and nobody else. I am not saying you can't do that with a bottle, because I did combi feed her too eventually and so I am 100% all for bottle feeding! But it was nice to be able to escape or her pinch her back and have her to myself for a while. Although when we introduced a bottle it was also nice to be able to escape for a few hours or go to bed early and leave her with daddy for a while! Combi feeding was not easy. Daisy didn't want a bottle at all. It took some serious persuasion and tears (from us both!) to get her to take to it. One day it just clicked though! Anyway, I digress. I read a blog post from Another Bun this morning on this topic and thought to myself she got it bang on!! Here is the post. A sentence that touched me the most was "Feeling #bressure (regardless of whether you wanted to breastfeed or not) isn't the sad thing here. It's that we have allowed ourselves to get so wrapped up in the defence of our parenting that we can no longer see the bigger picture. And that's a crying shame." And it really is so true, why do we judge people for their own choices? Whilst on Facebook the one day I came across the group The Lucky fin project, one of my friends who I met through my blog had liked a post on there. As you've probably guessed it's all in aid of people with limb deficiency's, and as the name suggests primarily arms and hands. I thought I would share this page with my readers as I know I have a few people who read this that are affected by it in some way or another. 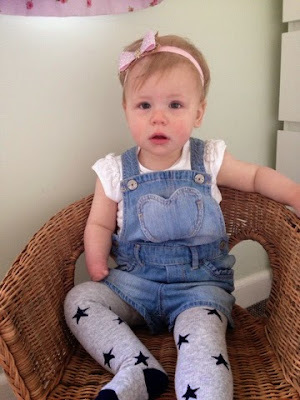 They share photos and videos on their Facebook of children with limb deficiencies doing amazing things and it is really inspirational to see, and can really brighten your day sometimes. It is strange really because you know there are others out their with limb deficiencies but it really isn't something you see often, so sometimes to see you aren't the only one really helps. Some of my friends and family have also joined the page, for exactly the same reasons I have. They actually are a charity and have their own website, the link is here. I absolutely love this sentence they have on the home page "If you've seen the movie "Finding Nemo" then you know all about Nemo's "lucky fin" and how being made a little differently doesn't stop him from accomplishing anything he sets out to do". And this is so true of Daisy in her first year. Daisy is a rascal. She climbs everything, she can shoot up the stairs in 5 seconds flat, she crawled without any issues, she eats well, she swims (as well as a 1 year old can!!) etc. I can't see anything getting in her way, and why would it? Another chairty group I follow closely on Twitter etc is REACH. I have talked about them before on my blog, but just in case you missed it. A bit of a ranty post today I am afraid. I am fed up of people giving me their pity, because I work. It has been mentioned a few times over the past few months, only in passing conversation but usually from people that don't really know me or anything about our situation. Yesterday a comment along the lines of "Oh you work, what a pity, that is such a shame" came my way. I put on a brave face, nodded and said well I work for many reasons and I am privileged that I still get to see my baby a lot. What she doesn't know is that I work from home a few days a week so I get to take her to nursery, pick her up, have a few hours with her to play and cuddle etc. Precious times that I know some mums don't get and actually I don't get some days when I am out at meetings or in the office in London. But to say that perhaps to a mum who has to be away from her baby a lot, do you not think she doesn't realise that??! What she also doesn't know is that I send Daisy to nursery for socialisation and development reasons, they can give her experiences that I can't always give her. She gets to follow other children lead and learn things that she can't get from us or the dog! As much as we pretend he is her brother! (a big, stinky, hair brother I know!) 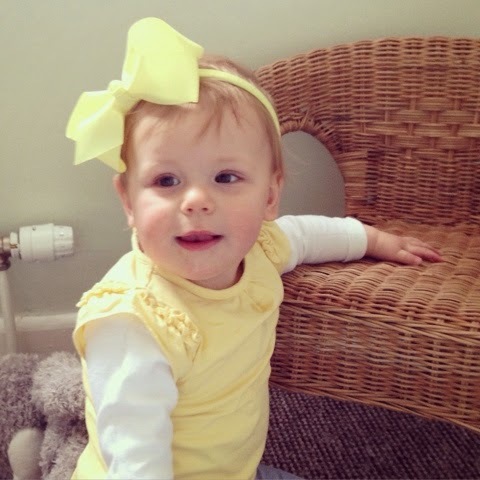 She gets to have a sense of independence and as sad as it is socialise without her mummy and daddy watching over her. She also didn't know that she goes to family twice a week. On a Friday she goes to her grandparents to be spoilt rotten and bond with them and then usually she goes to one of her aunties for half a day. All so important for building relationships, and if I could have my nephew or niece for a few hours every week I would. Family is important to me and always will be. I was brought up (as was my husband) in a close family environment and we want Daisy to have that time too. And again she doesn't know this but I actually want adult conversation, and to engage my brain in something a little more challenging from time time. Looking after a baby is a different kind of challenge, neither more difficult than the other but different all the same. It is actually not a bad thing to dress up nice, go to work, drink hot cups of tea and engage in something different for a while. By a while I mean a few hours, then I want to be back with my baby. She also doesn't understand how difficult it is for me to leave her in a morning, sometimes while Daisy is still snoozing. So for her to pass judgement is unfair. Then there is the financial side. How does she know I don't HAVE to work to keep us fed and watered? Maybe that isn't the case, but we still want a lifestyle where money isn't tight and a constant worry. But for others it will be a necessity. So please don't give others your pity and say "oh its a shame". It can be hard when people pass these comments on at times, because you don't know the reasons behind it! I mean this generically and not just personally obviously. So lady, who doesn't know me in the slightest, don't give me your pity! I choose to do what I do and that is that! 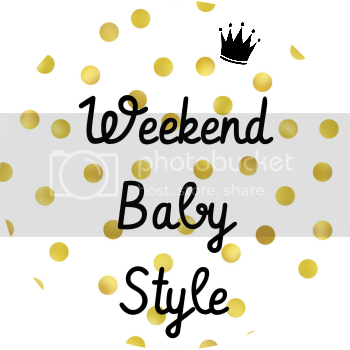 We are back with another #Weekendbabystyle post! A gorgeous Bow by Sprinkle of Bows (find her on Instagram! ), we bought quite a few off her recently and I love them! They just add that bit of sparkle! 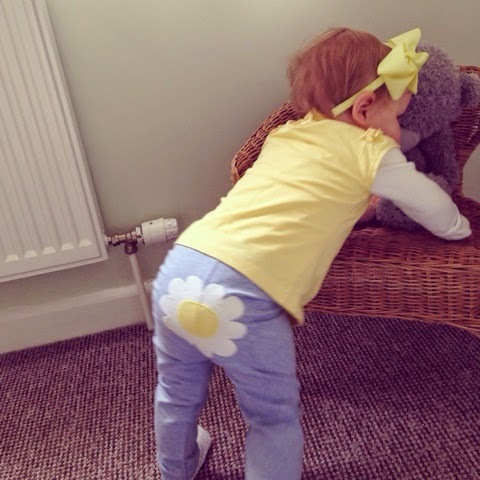 Little shorts dungarees by H&M, Frilly T-shirt from TU and Tights by Aldi! The tights are so soft its unreal! 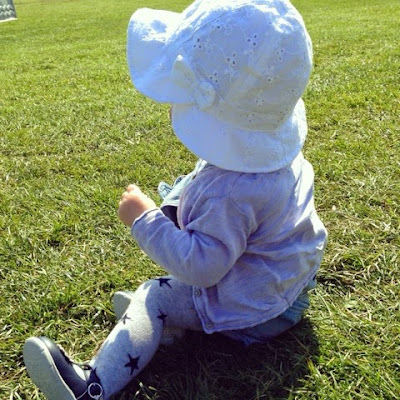 the sunhat is George by Asda and her Shoes are from a lovely little boutique in Shropshire called Shoe Be Do! I LOVE this outfit! It is my favourite thing I have dressed her in for some time! The Bow is by Bowtfiul Bows (Instagram), The T is part of the pack above from TU with a white George vest and the most adorable leggings from Next. She was lucky to get those for a birthday present! So cute! And don't forget you can join in too here. Random blog title, which I've now gone back and changed after writing that first part of the sentence! But as you will have guessed it's about the new little royal baby or baby princess, well actually more the Duchess of Cambridge and how I wouldn't swap places with her even for all of the tea in China! I was as excited and as happy as lots of other British people yesterday when I saw Kate was in labour and that there would soon be an announcement that there would be a new prince or princess, I loved then reading how they had welcomed a beautiful baby girl in to the world! 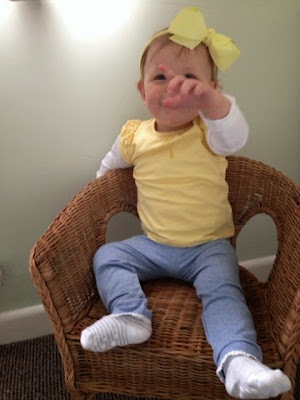 Because I'm sure the royals read my blog, "congratulations on your gorgeous baby girl!" I watched a clip of them introducing their new little bundle to the world and well the entire worlds media outside the hospital and felt pleased and happy for them! But then if I'm honest I also felt sadness. For William and Kate to have to share those first few moments with everyone and their dog felt a bit cruel. Some will say it's their role in society, and in some parts I would agree. But it just seemed too soon! I mean poor old Kate was dressed beautifully, hair blowing beautifully in the wind, face looking as perfect as ever, even little heels on for the occasion! But seriously is this what any of us would want to do just a few hours after giving birth? Wether we had make up artists, hair dressers etc or not, I don't imagine many women would fancy tottering out to the general public in a dress (my god, I didn't wear anything but Jamas or leggings for a month!!! ) and heels! How on earth did she do that?? I couldn't walk properly for two weeks and that was in slippers or flats, but heels?? I salute her!! Although I'd rather have poked my own eyes out than do it if I'm honest! Maybe a part of it is jealousy, how can any woman looks so glowy and fresh after giving birth? I looked like a zombie who hadn't slept for a week! Or at least felt that way anyway. But then really I was happy floating home in my new baby bubble in my comfies, hair braided back and with my slippers! I just wanted to absorb my baby, my new little family. Hopefully now the press and the world will leave them for a while now, let them get on with enjoying their new extended family and more than anything rest!